As I mentioned when I introduced Jen in my last post, suffering, pain, and trials in life are inevitable. Each of us has been and will be affected by the fact that we live in a fallen world where bad things happen… even to very good people. Where’s the good news in all of that? The good news is that we have a loving God who is always in charge. He can speak to us through pain and draw us close to Him for our eternal good and His own glorification. 1. Can you give your name and a few sentences that describe when and how your current struggles began, as well as what challenges you now face as a result? Pinterest, LinkedIn, Google+ Susie CantrellOn January 5, 1999 on the way home from work with our two children asleep in the back seat (we were in our Ford Contour four-door, ready to turn left off the two lane highway onto our country road) we were rear-ended by a Mac Truck, on impact going approx 65mph. 2. In the book of Job, we are taught that one of the ways God speaks to mankind is through our pain. What would you say God has taught you through your pain? This question makes me smile. Oh, the lessons He has and is teaching me. I’m writing a book about the numerous lessons. The main lesson topics are Trust and Obey, Believe and Love. These lessons reinforced the very foundation of my relationship with my Savior, Lord and Shepherd; my First Love. When every thing was taken out of my control and I lay in the cold, dark cave of my bedroom with my constant companion, Pain; the only comfort came from God’s Living Word that I had hidden in my heart, the worship songs from childhood through January 4 [the day prior to the accident] and my husband and children whom He loved me through. In the darkest years after the accident, Jesus was FaithFull as I was living moment to moment, completely dependent upon Him, breathing Trust and Obedience like oxygen while feeding of Belief and Love from the Bread of Life; washing it all down with Living Water. 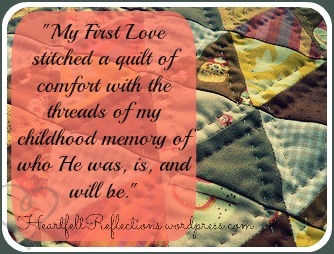 My First Love stitched a quilt of comfort with the threads of my childhood memory of who He was, is, and will be. Thus, connecting the scattered pieces of who I was in spite of Pain that relentlessly threatened to consume me, mind, soul and body; He was using Pain to focus my attention on who I truly was; created BeautyFull. Oh, He Knows me. I am gratefully in awe of the Love it takes to show me just how well. The lessons continue. 3. How has God spiritually refined you through your pain? I smile once again. God is continually refining me. The Identity Refinement was PainFull Joy. Even now I am going through the Another Refining Fire. He healed me of the 24/7 Distractingly Instense, Constant pain of the First few years. Then, He healed me from a specialized walker to a cane. With these physical healings came a new Refining Fire to suffer through. The Companion, Pain showed me layers of complex pain beyond the physical. Only God, my Father could use physical pain to bare the raw pains in my heart and soul. Physical Pain never limits itself to a physical injury. The Refining Fire Burns Hot, yet Jesus, as with the three long ago, is with me, near me in the Flames. The Spiritual Refinement I have gone through as I Live my Faith is worth every moment with Jesus. 4. The Bible teaches us that everything God allows in our lives is for our eternal good. How do you reconcile this fact with your situation? Have you seen His goodness in your suffering? Have you seen any good fruits come from your heartaches? Oh YES! God has shown me Wondrous Good through the pain in my life. There is a clarity of my perspective that is sharper than ever. One example is the recognition of the circumstances that my pain requires. My suffering and heartache from ‘loss of independence’ has proven a Blessing over and over. One example: I do not drive, therefore God has used these times to allow me to listen to hearts of those who get me to and fro. I have to concentrate to deal with my pain, especially in a vehicle so I am learning to ask questions and then actively listen more and more. I am His vessel of enCouragement that I could not be were it not for my pain. 5. How has God shown you that you can trust and hope in the Lord? 6. Do you have a go-to verse when you’re hurting? Or To what verses do you cling to keep your mind focused on His love, healing, power, etc.? Habakkuk 3:18, 19 (NIV) yet I will rejoice in the Lord, I will be joyful in God my Savior. The Sovereign Lord is my strength; he makes my feet like the feet of a deer, he enables me to tread on the heights. For the director of music. On my stringed instruments. 2 Corinthians 12:8-10 (NIV) Three times I pleaded with the Lord to take it away from me. But he said to me, “My grace is sufficient for you, for my power is made perfect in weakness.” Therefore I will boast all the more gladly about my weaknesses, so that Christ’s power may rest on me. That is why, for Christ’s sake, I delight in weaknesses, in insults, in hardships, in persecutions, in difficulties. For when I am weak, then I am strong. 7. Are you involved in ministry opportunities? How has your pain influenced how you reach out to the world around you? I must enCourage other Women. They are Not alone! God is using them right where they are! Right Now. No Matter What. My Pain has influenced me to reach out beyond my four walls because I can not be Silent about what He has done for me. Currently I have founded, SusieMM413 ~ Mountain Ministry. EnCouragement for the Journey. I enCourage other Women through Writing, Speaking, Teaching, Art. I am still listening and waiting to see what God will do with it. In the waiting, I am just enCouraging any who cross my path either in person, which is limited, or online, which is amazingly worldwide. I am also the Prayer Director for the worldwide HelloMornings Ministry. I also lead one of the small groups on Instagram now. I began on Twitter during their second session. I am grateful for all God is teaching me and for presenting opportunities to enCorage my Princess Warrior Sisters in Christ. I must brag on my God here also– for He took me from the back pew of a church to teaching in VBS, singing in the Choir, participating in the Christmas Production for a few years, co-teaching a Women’s Sunday School Class, helping with Women’s Ministry, helping with Annual Women’s Retreats, Teaching, Speaking and Leading Women’s Retreats, Leading Women’s Ministry, Going to Peru two years in a row for two week Mission Trips and Speaking at Conferences, Small Churches, and enCouraging our Brothers & Sisters in Christ there to Not tire of doing Good while enCouraging young women to Read the Bible for Themselves! Wow…Only God! Praise Him for He is indeed Worthy of All the Glory and Honor for all He has done with a companion named Pain through His Princess Warrior Daughter, whom He is Molding with Fire into His Vessel. May I continue to reflect Him and fight the good fight in Jesus’ name. I told you she was incredible! Can’t you feel her exuberance for the Lord jump off the page through her writing style?! And can you see why I called her courageous? I think facing struggles of the magnitude that she does each and every day takes great courage and faith. Thank you so much, Susie, for sharing your story and what God has taught you through this horrible accident that affected your whole family. I’m so thankful for His goodness in watching over your husband and children, and for providing healing (physical and spiritual) along the way for you. May God continue to bless you in your ministry as you encourage others and share all He’s done for you! 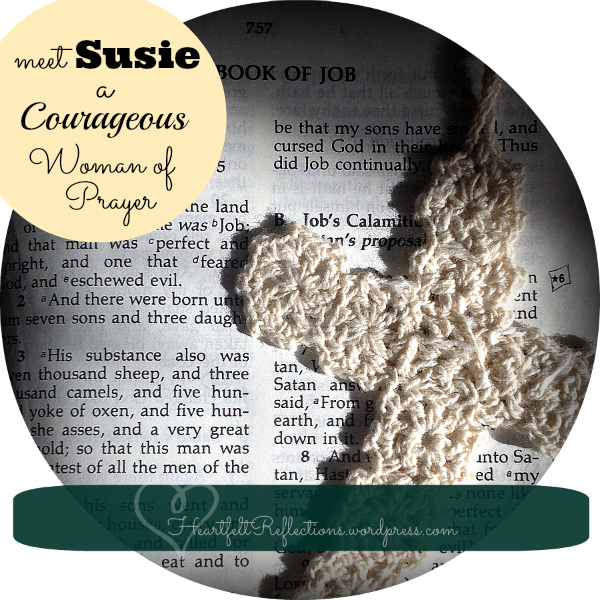 How has Susie’s story encouraged you? Reblogged this on Susie MM413 ~ Mountain Ministry.